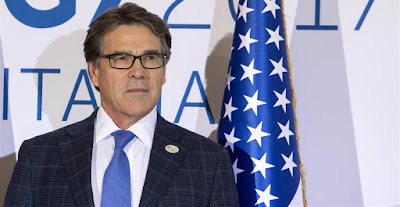 WASHINGTON, DC -- U.S. Energy Secretary Rick Perry optimistically discussed expanding American coal exports to Ukraine and other energy matters during a lengthy phone call this month with a Russian prankster who Perry thought was Ukraine's prime minister. Secretary of Energy Rick Perry poses for a family photo during the G7 Energy Ministerial Meeting on April 10, 2017 in Rome. Pranksters Vladimir Krasnov and Alexei Stolyarov are sometimes called the "Jerky Boys of Russia," after an American duo who put out recordings of their prank phone calls in the 1990s. They have made faux calls to British singer Elton John, who thought he was speaking to Russian President Vladimir Putin, and others.